Today is a very busy day in downtown Wellington for the NZI Seven Team parade that will kick off at 12:45pm from Lambton Quay and will ends at Civic Square at 1:15pm, where you can meet the teams and play some Speight’s Dodgeball. 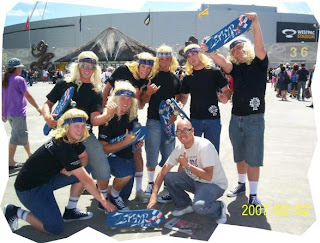 the NZI Sevens inside the Westpac Stadium on Friday 1 and Saturday 2 February from 12.30 – 6.30pm. Tomorrow, For the second time around I will join the rest of wellingtonian to witness the NZI Sevens at Westpac Stadium as 16 international teams battle each other for NZI Sevens title. What I like during this two day rugby tournament the people who will watch the event will wear costumes of their favorite characters from Princess up to Catwoman. « Why I loved Advertising?